Proof check before we engrave? --- Please Select --- No, I rely on your skills. (no refund basis) Yes, please email me a proof. Set upon a mother of pearl lid, this pill box features a sterling silver hippo and squirrel playing on a seesaw. 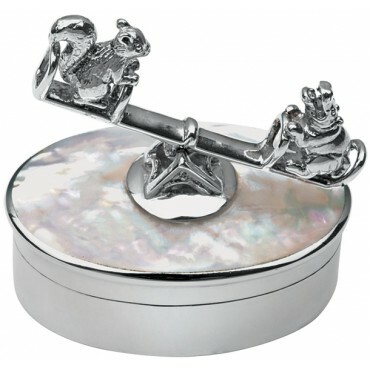 Playful and detailed, this pill box, which can be used as a pill box or as a keepsake box, is crafted to the highest standard from sterling silver. 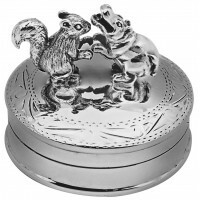 Personalise your pill box with an engraving of your choice to make a unique and treasured collectible.